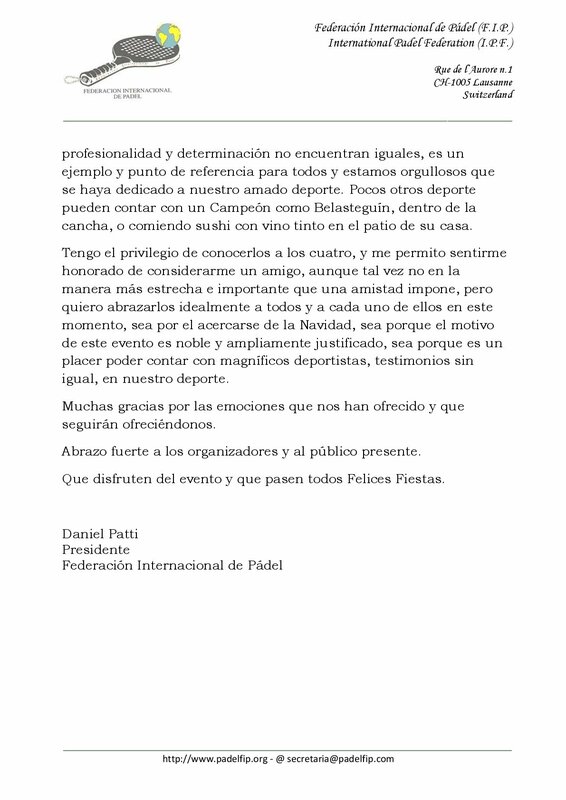 In view the historic event that took place yesterday in Buenos Aires, Argentina, the FIP President Mr. Daniel Patti wanted to send on behalf of the International Padel Federation some lines highlighting the important relevance for the padel history of the four legendary players who participated in “The challenge of the century”. ” We are facing a great event, we will not know if the best of the Century because we are still in its beginning, but we can surely confirm that it is probably the best in our history. There are four players on the court who, if they line up one behind the other, although mixed, all their titles, triumphs, photos and press articles, and sweaty shirts, can go around the Planet. They have written the history of our sport, past and recent. 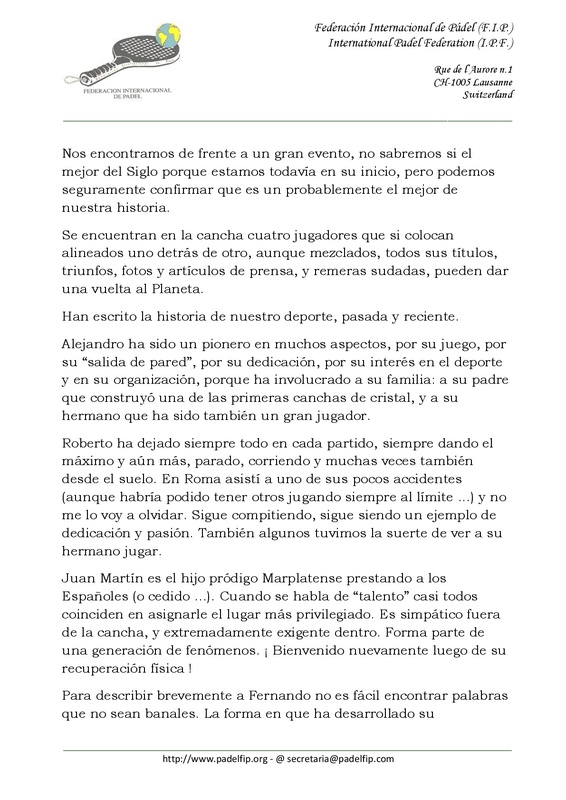 Alejandro has been a pioneer in many aspects, for his game, for his “exit from the wall”, for his dedication, for his interest in the sport and in organization, because he has involved his family: his father who built one of the first crystal courts, and his brother who has also been a great player. Roberto has always left everything in each game, always giving the maximum and even more, standing, running and often also from the ground. In Rome I attended one of his few accidents ( although I could have had others playing at the limit … ) and I will not forget it. Keep competing, it is still an example of dedication and passion. Also some of us were lucky enough to see his brother play. Juan Martín is the prodigal Marplatense son lending to the Spaniards ( or on loan … ). When talking about “talent” almost everyone agrees to assign the most privileged place. He is friendly outside the court, and extremely demanding inside. It is part of a generation of phenomena. Welcome again after your physical recovery! To briefly describe Fernando it is not easy to find words that are not banal. The way he has developed his professionalism and determination do not find the same, is an example and point of reference for all and we are proud that it has been dedicated to our beloved sport. Few other sports can count on a Champion like Belasteguin, inside the court, or eating sushi with red wine in the yard of his house. I have the privilege of meeting all four of them, and I allow myself to feel honored to consider myself a friend, although perhaps not in the most important and close way a friendship imposes, but ideally I want to embrace each and every one of them at this moment, be because of the approach of Christmas, either because the reason for this event is noble and widely justified, or because it is a pleasure to have great athletes, testimonies without equal, in our sport. Thank you very much for the emotions that you have offered us and that will continue to offer us. I strongly embrace the organizers and the public present. Enjoy the event and Merry Christmas to everybody.  http://www.padelfip.com/wp-content/uploads/2017/12/post-image.jpg 452 1192 padelfip_admin http://www.padelfip.com/wp-content/uploads/2017/11/FIP1.jpg padelfip_admin2017-12-23 12:33:242018-08-11 16:19:38FIP letter dedicated to "The challenge of the century"
A unique match. 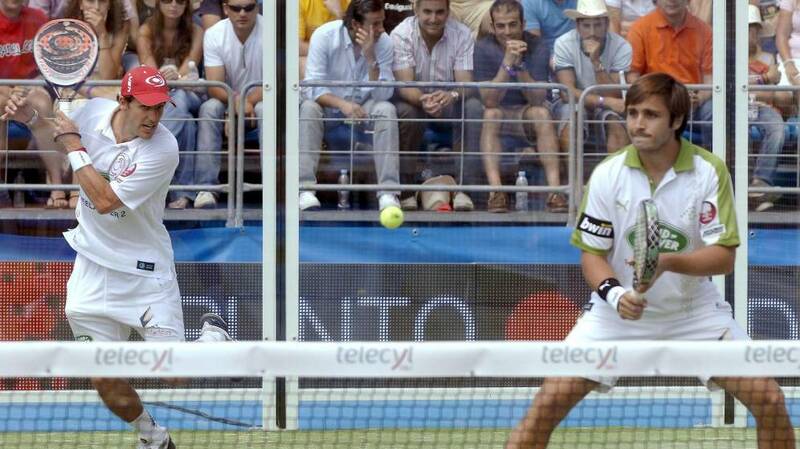 The two most important pairs in the history of the padel will face in an impossible clash. This December 22 at the Racket Club of Palermo in the city of Buenos Aires comes the challenge of the century: Roberto Gattiker / Alejandro Lasaigues vs Fernando Belasteguin / Juan Martin Diaz. 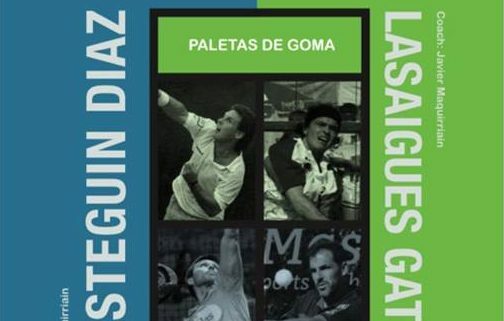 On the one hand, Roberto Gattiker and Alejandro Lasaigues, mythical pair of the 90´s decade, who formed a tandem from 1992 to 1996 reigning the world padel as number one for 5 consecutive years. They won absolutely everything, including three World Championships by pairs, and they won all the unbeaten records. 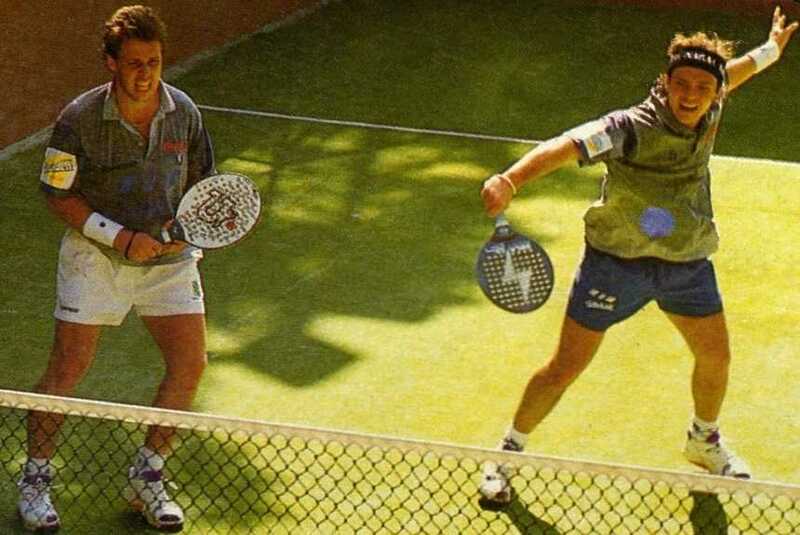 Undoubtedly, the best pair of the 90´s, true legends that with their game and talent contributed to an important spread of the padel sport thanks to their spectacular play on the court and their charisma out of it. On the other side of the court will be Fernando Belasteguin and Juan Martín Diaz, who formed a pair from 2002 to 2014. The only pair in the history of padel, in spending 1 year and 9 months undefeated, winning 23 consecutive tournaments and an impressive record of victories in more than 170 finals. Their reign as a pair at the top of the professional padel held for 13 consecutive years, where they also won 2 World Championships in pairs in 2002 and 2004. Awesome records for a pair of authentic legend. This challenge of the century will have a detail to match the disadvantage of age between both pairs: Fernando Belasteguin and Juan Martin Diaz will play with wooden padel rackets, as they were used in the decades of the 90s, while Roberto Gattiker and Alejandro Lasaigues will dispute it with the modern rubber padel rackets that are wielded today. The best pair of 90s with current padel rackets vs the best pair of the 2000s with padel rackets of the 90s. The two best pairs in the history of the padel face to face in a unique challenge. In this exhibition match, which will be played at a super tie break to 21 points, Gattiker / Lasaigues will be coached by Gustavo Maquirriain, while Belasteguin / Juan Martin Diaz will have Javier Maquirriain as coach on the bench. The proceeds of the event will benefit to El Futuro de Pehuajo Protected Workshop and the Fernando Belasteguin Special Padel School in Bolivar. The event will be broadcast live through the Padel Mundial cameras. 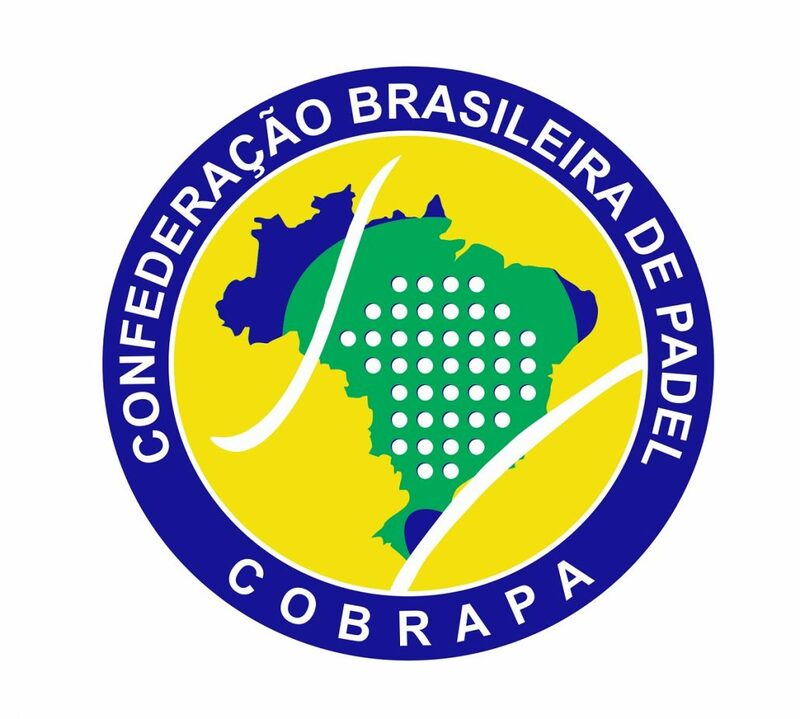 We officially acknowledge the change in the President position of the COBRAPA ( Confederação Brasileira de Padel ). We officially welcome Mr. Eduardo Langer as the new President of the COBRAPA and we wish all the best for him and his new Board. We are sure we will continue our fair cooperation, as it was with Mrs. Denise Ohlweiler during her Presidency period. FIP wants to express the greatest gratitude to Mrs. Denise Ohlweiler for the great work in the padel development in Brazil and all the World. Our big thank you Mrs. Denise! Mrs. Denise will continue providing support to COBRAPA Board in the brazilian padel activity and all the World. It´s a big pleasure to have such behaviour from the brazilian past-President, fact that we want to highlight. It’s time to continue working together on the padel development in Brazil. Welcome Mr. Eduardo Langer. Bem-vindo! http://www.padelfip.com/wp-content/uploads/2017/12/mr-eduardo-langer.jpg 516 812 padelfip_admin http://www.padelfip.com/wp-content/uploads/2017/11/FIP1.jpg padelfip_admin2017-12-15 17:36:082018-08-11 16:16:58Welcome Mr. Eduardo Langer! 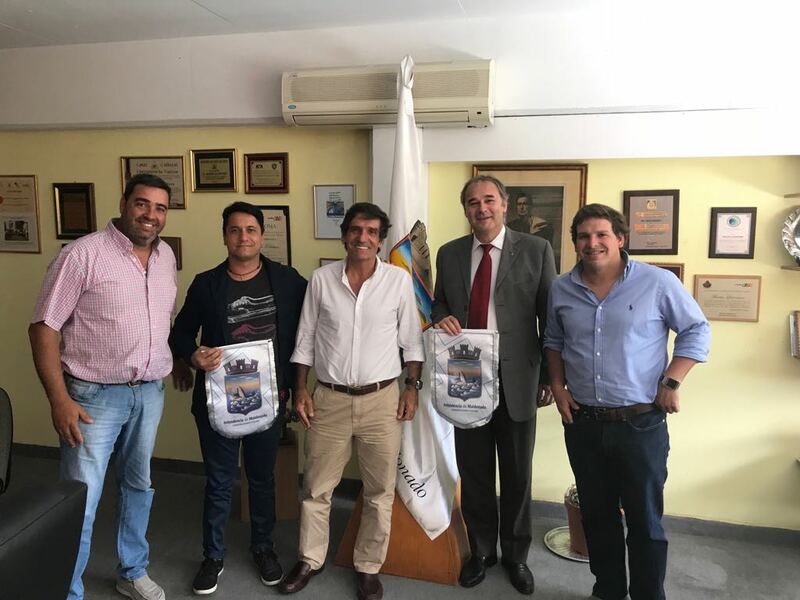 After visits to Paraguay to continue working for the 2018 World Championships and to Brazil with the presence in the South American Amateur Championships 2017, the FIP President Mr. Daniel Patti went to Uruguay to carry out a series of meetings with various national authorities and continue with the government efforts to support the FIP Champions Cup. 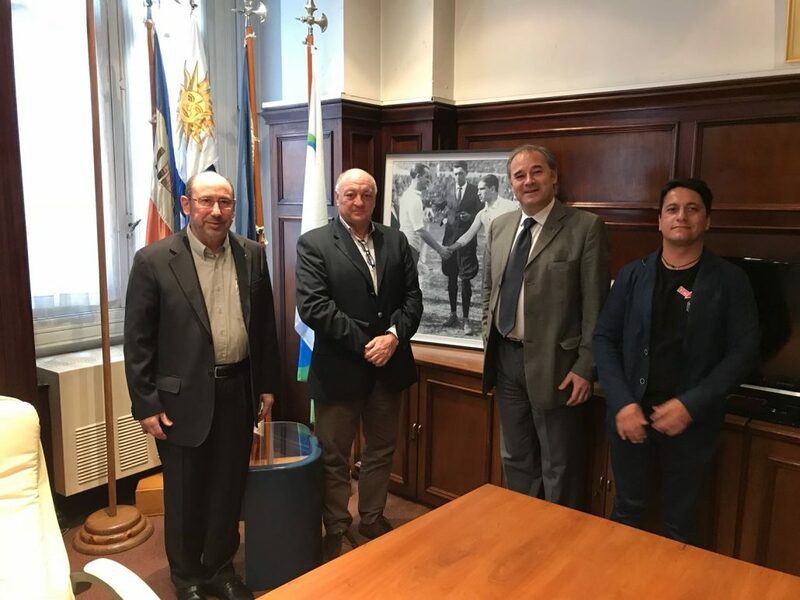 At the headquarters of the National Sports Secretary of the city of Montevideo there was a meeting between the National Undersecretary of Sports Mr. Alfredo Etchandy, the Coordinator of the Federated Sports Area Mr. Alberto Espasandin, the FIP President Mr. Daniel Patti and the AAP ( Padel Association in Uruguay ) President Mr. Diego Miller. As a backdrop to the meeting, the picture with the historic Final of the first World soccer Championship celebrated in 1930 that faced Argentina-Uruguay symbolized perfectly the friendly relations of the FIP with the uruguayan national authorities. After the meeting in Montevideo, Mr. Daniel Patti traveled to Punta del Este. At the headquarters of the Departmental Intendancy of the city of Maldonado, a strategic meeting was held to define the possibility of taking the FIP Champions Cup to Punta del Este in March 2018. The meeting was attended by the General Director of Sports and Events Mr. Martin Laventure, the Director of Events and Sports Promotion Mr. Marcelo Inzaurralde Cano, the General Deputy Director of Sports and Events Mr. Jose Martin Hualde, the FIP President Mr. Daniel Patti and the AAP ( Padel Association in Uruguay ) President Mr. Diego Miller. The visit to Uruguay concluded with the attendance to the opening of a course of the technical Training Program of the AAP, carried out by Nito Brea in the Padel Cristal club in Punta del Este. At the beginning of this course and accompanied by the AAP President Mr. Diego Miller, the FIP President Mr. Daniel Patti had a friendly talk with the attendees to inform them both of the latest details about the project to bring the FIP Champions Cup to Uruguay how about the interesting initiatives and projects that the FIP has for the year 2018. For Saturday 10 and Sunday 11 of February, the JPA ( Japanese Padel Association ) and the APF ( Australian Padel Federation ) prepare the 2nd Asian Padel Tournament, a friendly match that will take place in Goldcoast, a coastal city 70 kilometers south from Brisbane, Australia. A japanese team consisting of 6 players and 6 players, 12 players in total, will travel to Australia to play the 2nd Asian Padel Tournament. On Saturday 10, the male and female teams of Australia and Japan will face each other in a series of matches and on Sunday 11, mixed matches will take place to finish with a mini Tournament. 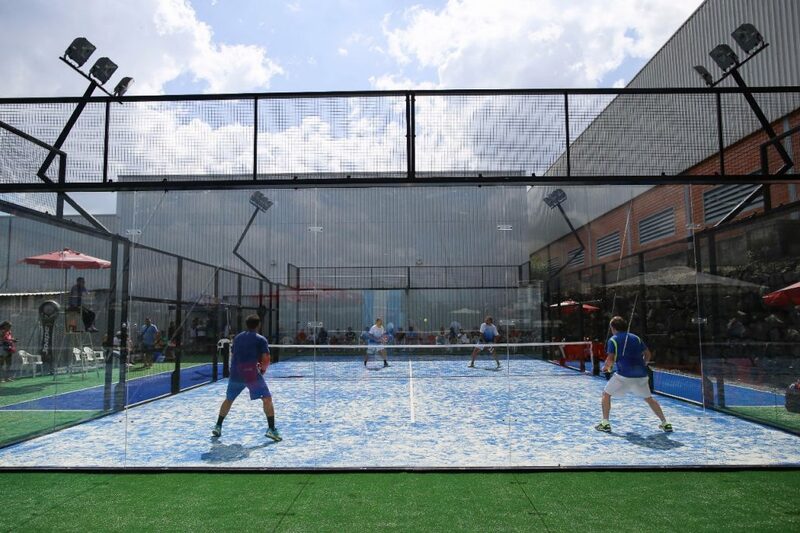 The first edition of the Asian Padel Tournament took place in the city of Bangkok, Thailand, in February 2017. A friendly match between Japan and Thailand, where each team participated with a total of 14 players ( 8 men + 6 women ). The victory was for Japan in male ( Kazuki Toyoda / Yuhei Kawabata ) and female ( Yuuka Tanigawa / Yuka Uehara ). JPA and APF are in permanent contact, taking care of all the details so that this friendly meeting at the beginning of the year is a success. One more step, in the good relations of friendship of the two Federations of Asia Pacific, that continue working for the padel development in their respective countries and adding efforts for the padel globalization. From December 1 to 3 was held in Bento Gonçalves, Brazil, the 2017 South American Amateur Padel Championships, organized by COBRAPA ( Brazilian Confederation of Padel ). 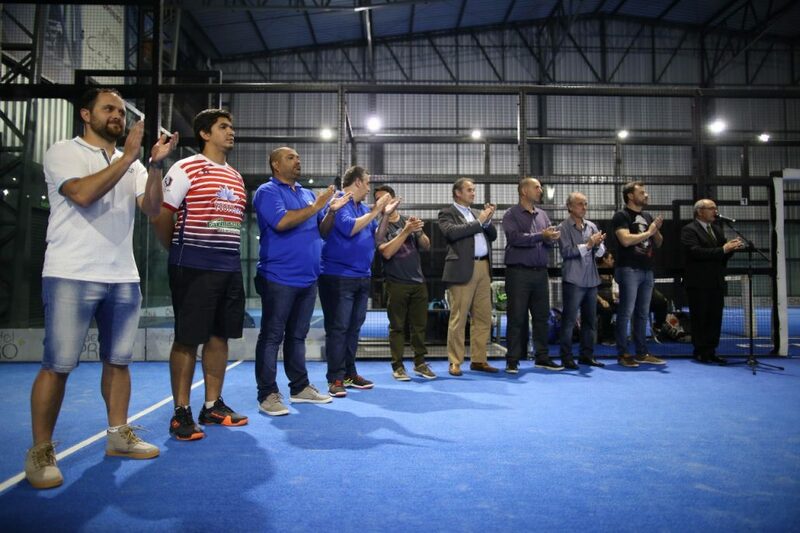 Amateurs players of Argentina ( APA ), Paraguay ( FEPARPA ), Uruguay ( AAP ) and Brazil ( COBRAPA ) played this Championships in the official venues of Padel Pro and Paddle One. A total of 326 registered players, 163 pairs representing their respective countries: Brazil with 66 pairs, Argentina with 38 pairs, Uruguay with 31 pairs and Paraguay with 28 pairs. The Competition was divided into 18 categories, both Male and Female, from 2nd to 6th and from +30 to +55 and was played by National Pairs counting the points for the final classification at the level of National Teams. A spectacular and emotional Opening Ceremony kicked off the Championship. One by one each selection made its entrance in the central court of Padel Pro waiting for the official parliaments of the authorities present in the act: the Secretary of Tourism of Bento Gonçalves Mr. Rodrigo Ferri Parisotto representing the Mayor of Bento Gonçalves Mr. Guilherme Pazin, Bento Gonçalves Secretary of Youth, Sports and Leisure Mr. Adão Valtamir Atzler, President of the Brazilian Confederation of Padel Mr. Eduardo Langer, FIP President Mr. Daniel Patti, Vice President FIP ​​and President of the Uruguayan Padel Association Mr. Diego Miller, Mr. Sergio Mandrini and Mr. Mathias Mercado representing the President of the Argentinean Padel Association Mr. Oscar Nicastro, Mario Vazquez representing the President of the Paraguayan Federation of Padel Mr. Rubén Duarte and the Partner-Director of the Padel Pro Club Mr. Juliano Bergamini. After the official parliaments to welcome players to the 2017 South American Amateur Padel Championships was a moment full of emotion when a respectful minute of silence was dedicated in memory of the 44 crew of the Argentine submarine ARA San Juan who died in waters of the South Atlantic. There were 3 days full of excitement, hundreds of matches and long padel days in search of the title in pairs in each category and adding points for the final classification at the level of National Teams. Check here all the list of Champions of all the categories disputed. At the level of National Teams, in Free Category, Brazil added 680 points, Argentina 660 points and Paraguay 80 points. In the Veterans Category, Argentina added 800 points, Brazil 640 points, Uruguay 340 points and Paraguay 180 points. In the overall calculation adding both categories, Argentina obtained 1480 points, Brazil 1300 points, Uruguay 340 points and Paraguay 260 points. 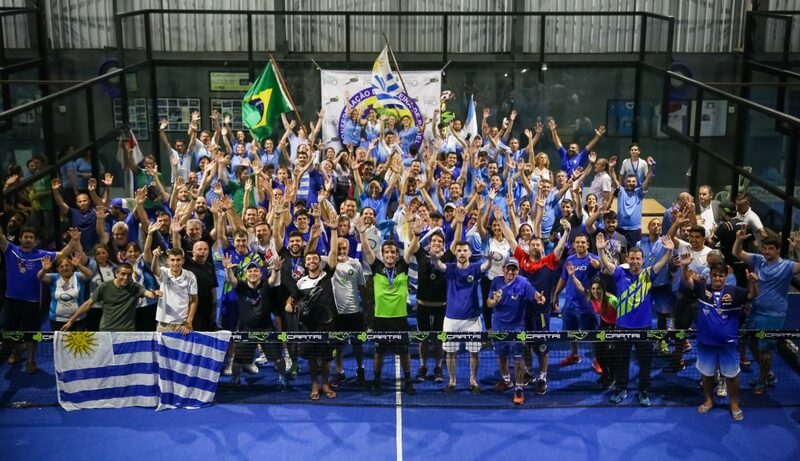 With the Final Ceremony rewarded the effort of the players ended a sensational weekend in Bento Gonçalves, where they have lived days of harmony and great passion of the South American padel amateur. Enjoy with the best images of this 2017 South American Amateur Padel Championships. The Netherlands hosted this past weekend one of the most important FIP ​​Tournaments of the 2017 Calendar. Organized by the NPB ( Nederlandse Padelbond / Dutch Federation of Padel ) and with the support of Padel Academy, this FIP500 Padelshop.com was played in La Playa, club located in the city of Rijswijk and a few kilometers from The Hague. Many players arrived from different countries of the European continent ( Spain, Italy, Germany, France, Belgium, United Kingdom, Sweden, Greece and The Netherlands ) did not want to miss the appointment. Rounding out the 70 registered pairs and with the participation of relevant names of the professional WPT scene on the courts of La Playa, from Friday to Sunday there was a splendid atmosphere with very good matches full of emotion and a spectacular level of padel in Men’s and Women´s Category. The Men’s competition started on Friday with the Qualification Round. High level matches, both to access to Final Draw 1/16 to be played from Saturday morning, afternoon in 1/8 and Sunday morning in exciting 1/4. Excellent level in Semifinals: Darek Nowicki / Guga Vazquez 7-5 5-7 7-5 vs Lucas Cunha / Victor Sanchez and Jose Carlos Gaspar / Jorge Ruiz 6-4 6-1 vs Andres Britos / Fermin Ferreyra. In the Grand Final, Jose Carlos Gaspar and Jorge Ruiz defeated Guga Vazquez / Darek Nowicki 6-2 6-2, winning this FIP500 Padelshop.com. In Women’s Category, Saturday started the competition with the Final Draw of 1/8. Great confrontations in all the rounds until reaching the Semifinals. Carlota Garcia / Laia Bonilla won 6-2 6-1 vs the french-swedish pair Kristina Clement / Antonette Andersson, and Silvia Plasin / Belen Berbel 6-3 7-6 vs Raquel Piltcher / Helena Wyckaert. In a 100% spanish Final, Carlota García / Laia Bonilla won 6-3 6-4 vs Silvia Plasin / Belen Berbel conquering the title FIP500. 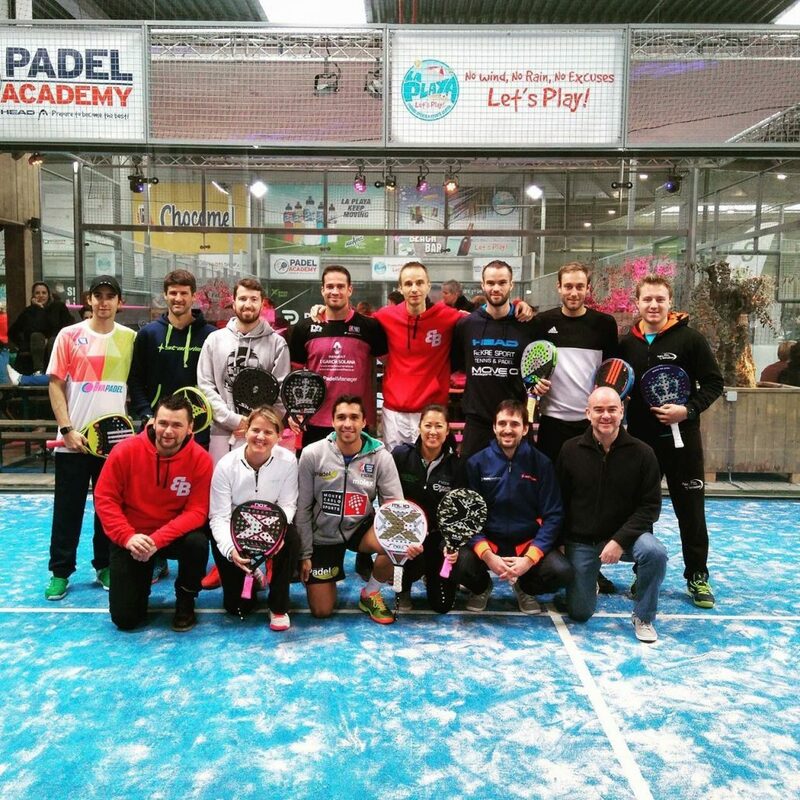 Beyond the competition, this FIP500 Padelshop.com has again served as a reunion between players from all over Europe. 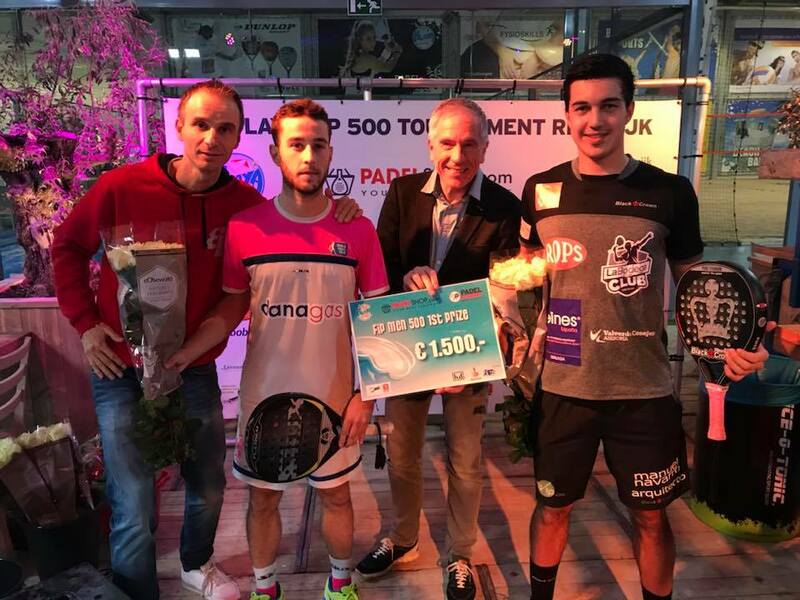 A fantastic atmosphere that has been lived throughout the weekend in Rijswijk with a great organization by the NPB ( Dutch Padel Federation ), Padel Academy and the club headquarters La Playa. 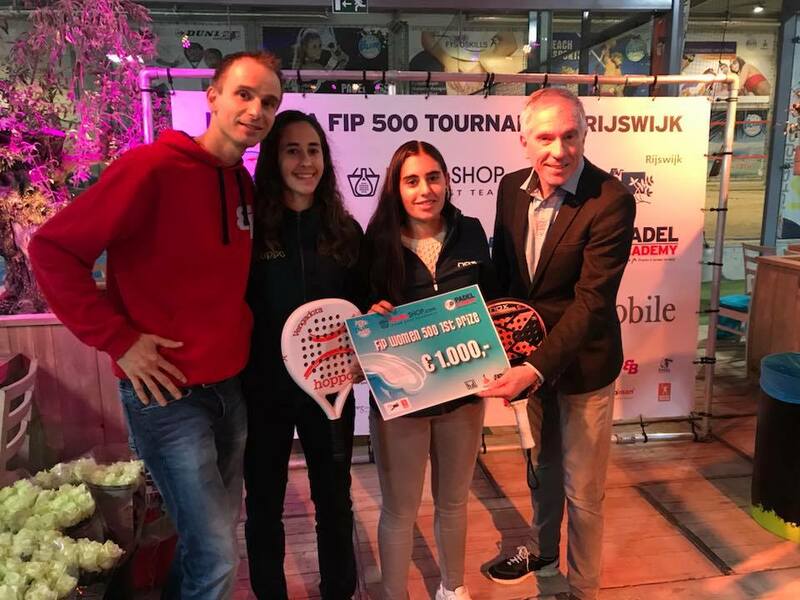 Check all the results of this FIP500 Padelshop.com tournament in Setteo and the best pictures in the photo album. 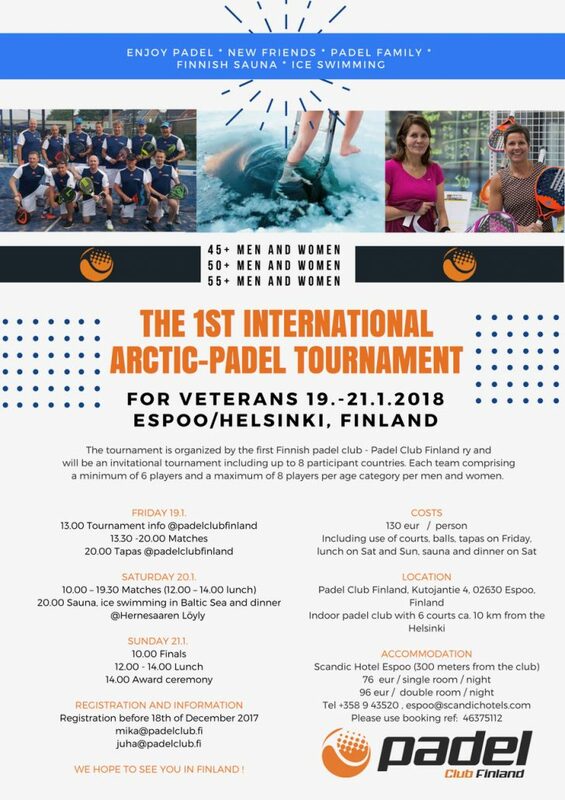 With the support of the Finnish Padel Federation from January 19 to 21 will take place the 1st Arctic-Padel International Tournament, Friendly Tournament for Veterans over 45 years of age. The facilities of Padel Club Finland, located in the city of Espoo, will host this historic first edition. An exceptional opportunity to participate in a complete friendly event, with players coming from different countries and participating in different categories: +45, +50 and +55. This 1st International Arctic-Padel Tournament will be an invitational tournament including up to 8 participant countries. Each team comprising a minimum of 6 players and a maximum of 8 players per age category per men and women.